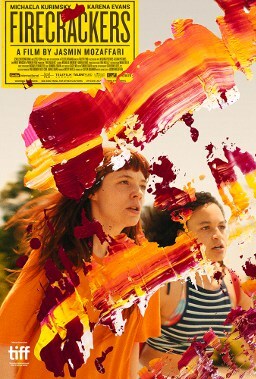 Jasmin Mozaffari’s directorial debut, Firecrackers, was named one of TIFF’s top ten Canadian films last year. The film follows two teenage friends, Lou and Chantal, who plan to ditch small-town life for the big city. These plans are thwarted when Chantal’s possessive ex-boyfriend assaults her, leading the women to take revenge. We chatted with Jasmin about the film this week. SDTC: How are you similar to the young women in your film? How are you different? JM: I always saw Lou and Chantal as two sides of myself and, for that matter, of many women. At first, Lou is someone who challenges misogyny at all costs and pays the price. Chantal, by contrast, finds safety in complacency. I have been and am still both of these women; however, in the film both Lou and Chantal shift considerably, challenging even their own firmly held beliefs. I think in this way I’m just like them, too; however, I think both of them are braver and more impulsive than I am in their actions. Why did you want to make a film that depicts real women on screen? For so long, ideas of women have been filtered through a male gaze, both by male and female writers and directors. These depictions have been grossly inaccurate and are dangerous and restrictive. The same argument is happening around race and sexuality. I wrote characters based on young women I knew, first to be authentic to my own experience, but also to purposefully disrupt traditional, outdated portrayals of women on screen. While I have been touring around the world with Firecrackers at festivals, an overwhelming amount of women have approached me after the screening to share their thoughts. The women are of all ages and backgrounds, but they often tell me that the film struck a nerve with them and that they could relate to Lou and Chantal’s hopes, desires, and fears. I think because they were able to see part of their female experience validated on screen in an honest, unfiltered way, that experience has been liberating for them, and for me as well. Your all time fave film (and why)? I get asked this a lot and I could never pick one. So many films have influenced me in many different ways. Andrea Arnold and Lynne Ramsay have made some of my favourite films, so I would pick Fish Tank and Ratcatcher, but that’s only scratching the surface. What advice would you give to your fourteen-year-old self? Embrace your roots. You’re different, and that’s a good thing. It’s not a bad thing like your peers are suggesting. Who has made a big impact in your life recently, and how? I would say my mom. I lost my dad a few years ago, so having her as a pillar of support has been the most impactful. Getting out of the city with my partner, going for a drive or hike in nature, letting my mind wander. Cooking a good meal and feeling rejuvenated before the work week starts up again. What’s the best part of being your current age? I’m thirty-one, and I don’t miss my twenties. I think being more sure of yourself, having more confidence (which comes with age) and valuing your own voice are aspects I appreciate. Being humbled by the ups and downs of my twenties has helped me to become more self-aware and patient (most of the time). You start to realize more and more that everything changes all the time, even you, so I try not to think in absolutes as much as I did when I was younger. What are you sick of hearing about? Men making fun of the #MeToo movement and/or complaining they’re losing jobs due to parity initiatives. What is your mantra these days? I don’t really use mantras but I’m trying to be very proactive in finding time to be alone with my thoughts and valuing that time. What art work would you love to have in your space/on your walls, and why? I moved earlier this year to a new apartment and right now I’m really into less is more with my walls and decor. As a writer and director, there’s always so much going on in my head, so honestly blank walls and minimalist settings are what I need to feel balanced, but that could change! Fave rainy day comfort food? Or activity? Indian food and binge-watching either a true crime or Netflix/HBO/Amazon series. Fave place to spend time in Toronto? The Junction. I moved to this area not long ago and find new things to love about it all the time. So many things: veterinarian, a doctor, a lawyer, a teacher. There weren’t many female directors to look up to, so I didn’t consider that until MUCH later. What adult task would you like to get better at? If you could spend a year studying something, what would it be? I would love to connect more with my Iranian heritage, so probably Iranian history and culture. Firecrackers opens this Friday, March 29.